When it comes to the biggest selection of used ultrasound equipment at the lowest prices, it’s hard to match UsedUltrasound.com. We have years of experience in providing affordable ultrasound supplies to the medical industry, and we have developed a loyal customer base because of our high quality equipment and 100% satisfaction guarantee. 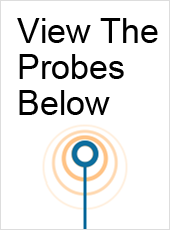 Our inventory of used ultrasound probes for sale includes a complete selection of used endocavity ultrasound probes and transducers from leading manufacturers like GE, Philips, Zonare and many more. Our goal is to save you money on all your ultrasound equipment purchases, so contact us right now if you need pricing information on any of the refurbished ultrasound probes for sale on our website. Our inventory of used endocavitary ultrasound transducers for sale is extensive, but if you do not see the particular model you need then chances are we can locate it for you. We have connections around the world who can help us secure quality used ultrasound equipment at the lowest prices, and then we pass those discounts on to you. UsedUltrasound.com is an FDA-registered company that is based in the United States, which is something you won’t find from an auction website or overseas seller. If you need to purchase used endocavity ultrasound equipment, contact us today and let us show you how much money you can save. In addition to selling quality used endocavitary ultrasound transducers and probes, we also provide ultrasound repair and service contracts to help you save even more money. And we know that your time is valuable, so we promise not to waste any of it if you are looking for ultrasound equipment pricing information. Simply fill out the online contact form or give us a call if you would like a no obligation price quote on any of the endocavity ultrasound transducers for sale on our website. 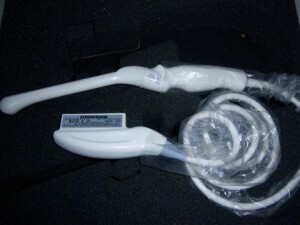 The GE E8C-RS ultrasound probe is a micro-convex array. The GE E8C-RS ultrasound transducer is compatible for use with the GE Vivid S5, GE Logiq i, GE Logiq Book, GE Logiq Book XP, and the GE Voluson i/e.